Henry Moore is widely considered to be the greatest sculptor of the twentieth century. He entered art school at the end of his service in World War I, and was keenly sensitive to the influence of modern and ancient sculptural traditions, especially the figures of Pre-Columbian Mexico. His mature style emerged during the 1930s while he was a young member of the Surrealist circle in England. In the years following World War II he gained an international reputation with his monumental outdoor figurative works. His "Two Piece Reclining Figure No. 9" exemplifies Moore's belief that more abstract forms could possess great spiritual vitality: "In this way I can present the human psychological content of my work with the greatest directness and intensity." In Reclining Figure No. 9 from 1968, Moore reduces human form to its barest minimum. Notice the simple protrusion of a head and shoulder on the right, the cavity of a chest or belly in the center, and the pointed shapes of two legs coming down on the left. He pulls the individual forms apart and lays them out horizontally—like an assembly of natural elements shaped by the action of wind and water. 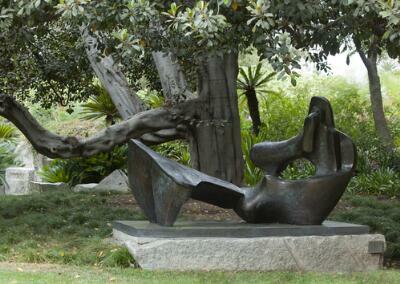 Following the path to your right, you’ll find another reclining figure by Moore, made about ten years earlier. Here, it’s easier to make out the human form. Notice the subtle transitions from one shape to the next, as the fragmented figure twists to face the sky. Universal shapes speak to all of us, he said, and we can respond to them if our conscious mind does not get in the way.